Arūnas Matelis has been awarded the main accolade in the "LT Tapatybė" ("Lithuanian Identity") awards last Monday, February 19, in Vilnius. 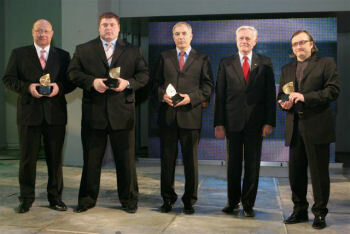 There were six awards in all, given to Lithuanians who best presented Lithuania to the world in 2006. The awards to Matelis and other winners were presented by President Adamkus in a ceremony in Vilnius. The awards are statuettes in the form of a drop of water, created by the artist Eimantas Ludavičius. directed 8 films and produced about 40. 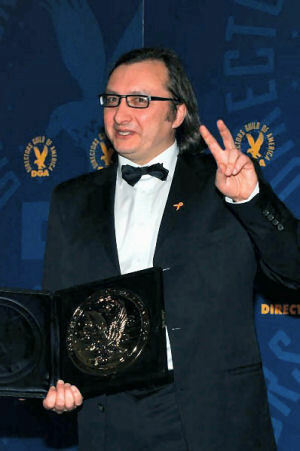 His film "Before Flying Back to Earth" has been shown on TV in more than 10 countries and had already won prizes in the Silverdocs, Brooklyn, Amsterdam, Madrid and Leipzig festivals. (For more information on Arūnas Matelis please see the article on him in the Lithuania / Famous People section on this SLIC website and the News item of 20/08/06). Žydrūnas Savickas in the Sports category. He continues as the undisputed World Champion strongman (See News 04/11/05 & 17/12/06). Viktoras Butkus in the Business category. Viktoras Butkus is the General Director of the innovative biotechnology company "Fermentas"
The soprano Violeta Urmanavičiūtė-Urmana in the Culture category for her role as an international leading soprano in world opera (See News 24/12/06). Viliumas Malinauskas in the Tourism category. He is the founder of the famous Grūtas Park near Druskininkai in Lithuania, where Lithuania’s history under Soviet tyranny is displayed in a theme park setting. The world famous avant-garde filmmaker Jonas Mekas in the new category for "Life’s Achievements" (See News 12/11/06).